While supplies last, Pre-orders will be shipped with a CD copy of Suburban Home's Mix Tape Volume 9, "Discover You, Discovering Me" as well as an automatic download. 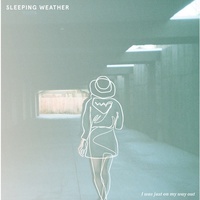 Suburban Home is excited to release the debut full length by Denver's, Sleeping Weather. Sleeping Weather is an indie rock band formed by friends (after playing in bands like Crooked Ways and Bankrobber) with a shared love of music and touring. Wanting to tour more Zach, Vince, and Toby started Sleeping Weather in 2011, self-releasing their EP Disconnect. They wasted no time hitting the road. With numerous tours under their belts, they are now set to release their debut full length I was just on my way out via Suburban Home Records. I Was Just On My Way out was recorded in July of 2013 with Wesley Johnson at Archive Recordings (Reviver, Heartless Breakers, Cutl Leader, The lionelle) in Salt Lake City, Utah.